Deal of the Day: Score 40% off tickets to the Phoenix Suns' last home game this Friday! Don's miss the last home game of the season! Are you ready to see some shooting stars? Literally! We're talking about the athletes and stars who can shoot and dunk on the court. 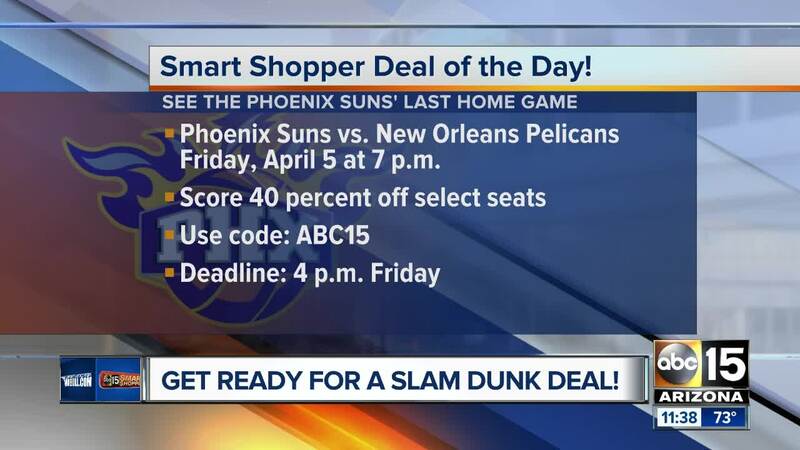 I'm scoring you a Smart Shopper Deal of the Day to enjoy the Phoenix Suns' last home game of the season for less! Friday, April 5, they're taking on the New Orleans Pelicans! The game starts at 7 p.m.
Our Deal of the Day gets your 40 percent off select seats. Go to www.suns.com/smartshopper to find valid seats, and enter the promo code: "ABC15." You have until 4 p.m. Friday to score the discount. In addition, it's Fan Appreciation Week! The first 5,000 fans will receive a Suns Car Shade as well. It's important to note that there are concerts Friday night, "First Fridays" for downtown Phoenix, and the Diamondbacks have their home opener. Expect a higher volume of traffic. Fans are encouraged to arrive early to avoid the delays. Talking Stick Resort Arena doors will open at 5 p.m., two hours before tip-off. To help alleviate the traffic woes, you also get a free light rail ride with a game ticket! Enjoy, and root on our Phoenix Suns!